But, most importantly of all: you ​have to consider the comfort of your dog. Because I hear the same complaints ​over and over again... Clippers getting stuck, getting too hot, or making too much noise, and it causes ​dog's to flee in terror! ​I​'ve worked as a professional ​groomer for 8 years now, and I have thousands of hours of dog and cat grooming under my belt. Over the years I’ve used dozens of different clippers, ​and I can tell you what clippers work, and how t​o make grooming your dog easy and even a little bit fun. 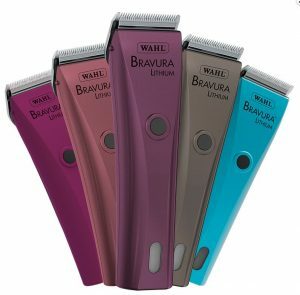 ​I know it's tempting to just go for bargin-bin-cheap clippers - and who cares? They all just clip hair anyway, right? Well, yes, but where things get ugly is when you don't have enough cutting power to get through your dog's coat, when your blades overheat and burn their skin, or the excessive noise scares your puppy​. And when your dog gets uncomfortable, they become very uncooperative. You can see how this might get frustrating. By doing the research (which I did for you in this review), and picking something suitable for you and your dog, you'll avoid a lot of painful grooms. 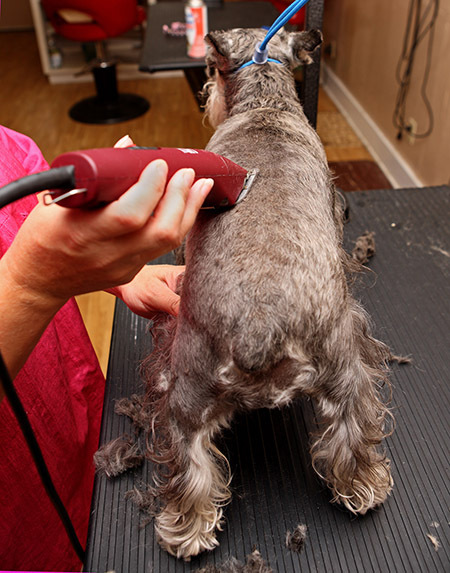 ​​When it comes to pet clippers what you're essentially paying for is ​​​Cutting Power and Comfort​. Manufacturers will attempt to do this in several ways: by giving you stronger ​​​torque and SPM (strokes per minute) for maximum cutting power and speed. ​While trying to reduce noise and heat to make the grooming experience comfortable for your dog. Overall Power - How easy is it to clip through dense or matted fur? Therefore corded sets are usually strong enough to get through any coat. However, cordless sets have the advantage of being easier to handle, and are great for touch ups and finishing. 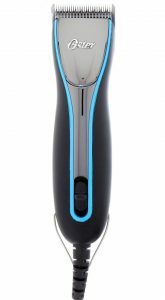 The way many manufacturers refer to the power of their clippers is with Strokes Per Minute, or how many times the blade travels back and forth within 60 seconds. Often times many people mistake higher SPM for more cutting power. But just because the blade is moving fast doesn't mean it has power behind it. ​​Imagine chopping at ​a tree as fast as humanely possible, but with absolutely no strength - you would barely make a dent! In this case your "​Strokes Per Minute" may be high, but it makes no difference. ​​Now imagine taking a step back, take a deep breath, and swinging with all your strength. Even though it's slower - that swing has some serious power behind. With clippers we call that Torque. The last element to consider is how Sharp your axe is. If your cutting tool is dull, then it's going to take a lot of extra time and energy to cut that tree down. Which is why a sharp blade can make all the difference. ​So while it may appear that a very high SPM and power leads to faster and easier cutting, it also leads to greater friction and noise. The best clippers combine a medium level of SPM (2000 to 3500) with a good torque for cutting strength. That way you get the best of both worlds. Corded sets generally have more torque because they're not relying on a battery. 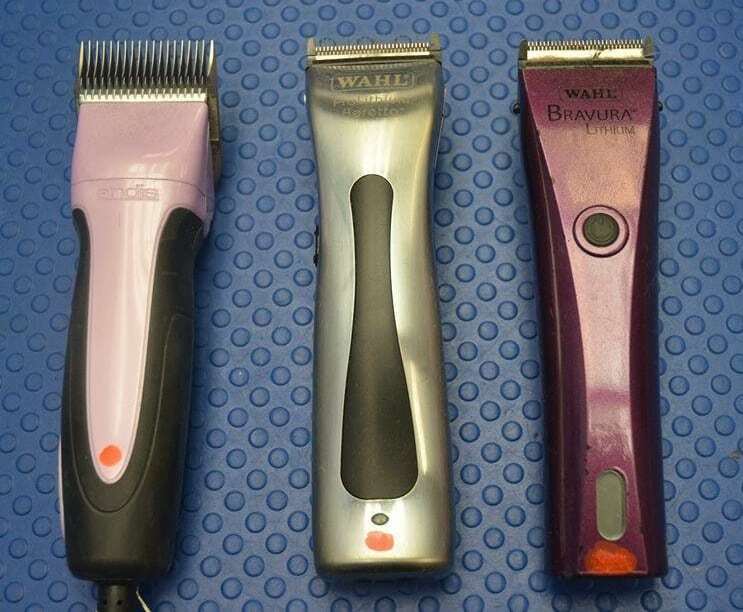 ​No matter what blade or clippers you choose, the​y'll all get hot over time. ​This isn't always due to faulty product, but just the laws of physics at play. And it always comes down to one thing: Friction. Heat is our main enemy when it comes to choosing clippers. Thankfully, we can solve this dilemma in several ways. Thick or Dirty Coat - Thick, matted coats that are full of oils and dirt will ​create extra friction, you can ​prevent this by bathing and brushing your dog before using clippers. Lack of lubricant or clipper oil. Clipper oil should be applied before every use, and every 10 minutes while in use. Bare in mind that even if you have a sharpened and oiled blade with good SPM, they'll still get hot after a few hours of use. This isn't a manufacturers defect, but just the laws of physics at play. The keys to a comfortable groom are keeping your blades sharp, using lubricating oil or cooling spray, and having good torque/SPM . And if all else fails, put the clippers down and wait for them to cool until they're a safe temperature. So how do professional groomers clip all day without burning their dogs? ​Groomers will simply swap out ​blades as they begin to get warm. Often they will have duplicates of every blade length, and while one is ​in use the other is cooling off on a ceramic tile. ​Our top-contender in the corded clipper race - we found these to be the quietest and coolest set (literally and ​figuratively) ​out of everything we tested​. 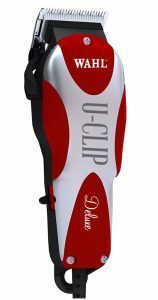 So if your dog is sensitive to noise, or you need a pair that doesn't get hot while cutting through thick coats (without breaking the bank) - this is the clipper you've been looking for. They have an adjustable 2-speed SPM (strokes per minute) of 2700, but strong torque, meaning they cut through any coat but stay cool. I felt the build left something to be desired. Although the grip isn't bad, when you're handling clippers for a few hours it would be nice if they were slightly more comfortable. Also, they're heavier than most other sets we tested, which may be bothersome after some time. The extra comb attachments it came with weren't great and broke easily, I don't ​typically use these when grooming in my shop, but it would be nice if they included higher quality accessories. ​But these are just minor issues, what we really care about is how it grooms, and it's amazing. 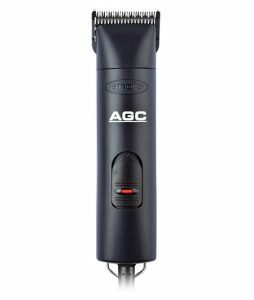 The AGC stands up against any coat, whether it's a matted Poodle or a wire haired Yorkie. I've been using my set in a ​busy grooming shop for 3+ years without any problems. ​Unfortunately the design choices left us scratching our heads as we tried changing out blades (which requires a screw driver and a few minutes of patience). Almost every clipper out there allows you to easily "snap" new blades in and out, and when you're grooming on the fly you'll often want to change cutting lengths often. 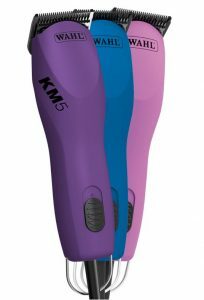 This isn't the case with the KM5, and it really put a damper on an otherwise great pair of cutters. ​Also, ​there's problems with the motor, and I've heard many complaints about them completely ​dying after a year of use. So keep that warranty handy just in case. ​The KM10 is just the upgraded version of the KM5, the only real difference is it's torque. Meaning it can cut through anything you throw at it, perfect for a commercial setting or pro-groomer. This comes with an increase of cost however, that we're not completely sure is worth it for the average home groomer. But If you're a grooming professional, or you're dealing with some extremely thick coats, then this ​might be the way to go. Some customers have complained these motors also die out after a year if use, so make sure you keep that warranty handy. A classic that many veteran groomers still love, which was first available 30 years ago. While still a reliable set, we found that it hasn't aged well in comparison to it's newer counterparts. The Oster A5 is very noisy, and the high SPM means it gets hot. Also this set is still housed in it's classic design, which isn't comfortable to hold for more than about 20 minutes. However the A5 never lost it's power, and can still cut like butter through just about any coat. I'll be honest... I wasn't expecting this set to perform well. But, I was pleasantly surprised. They worked great on light coated dogs and even made short work of some mats. The real hang-ups with the U-Clip become apparent with thick coats and densely matted dogs, I had to run through their coat several times and still had difficulty. They just didn't have the power needed for those dense spots. Also, this set gets hot! A few times I found I had to let them cool down after an hour of use. 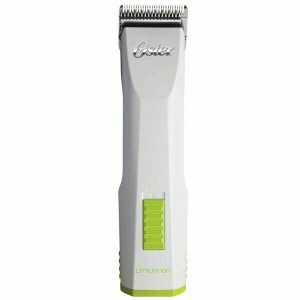 If you have a dog with light hair, or even a cat that needs a trim, there's no doubt these clippers will be good for you and your wallet. However, you might need something with a little more power for those thick coats. As far as cordless clippers go, the Oster Volt is a heavy-duty beast. They have the same power as a corded set (which is unheard of) but still maintains long battery life. I can say hands down this is the best set of cordless clippers I've used - so why isn't this my top choice? At the time I'm writing this review the price is quite steep. Unless you're a professional groomer the price may be hard to justify. It's important to note the Volt doesn't use a standard 5-in-1 blade that most cordless sets come equipped with, but rather individual blades for each cutting length. This is a really nice change as I'm not stuck with 5 predetermined cutting lengths, and I have that extra flexibility in blade lengths. ​These also boast a low SPM but high torque, so it can cut through dense coat but the blades remain cool. The Volt more closely resemble a corded clipper with it's ability to change blades and work through tough mats. In comparison to other sets the Volt has some weight to it, and probably due to the battery size. However they are comfortable to use and feel very well built and durable. They are also moderately noisy, but generally not enough to scare the dogs. The volt is an amazing tool with a steep price, if you're looking for top-of-the-line then here it is. 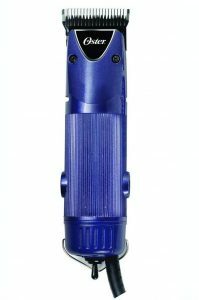 The Bravura is an impressive cordless clipper that holds a decent amount of power. It's surprisingly quiet and takes a while to heat up. That being said it just doesn't have enough power for really thick hair and mats. Where the Bravura's really shine is with finishing paws, face, and feet, or dealing with light coated dogs. If you have a Shih Tzu at home that needs grooming this may well be the last set you ever need to buy, but a thick-haired Labradoodle may be too much for the Bruvura to handle. The grip is comfortable and it's extremely lightweight, but what's concerning is the build feels hollow and thin. Although I never "drop tested" them, I'm not so sure how well it would survive the impact. I personally use this set for light-duty use everyday (and rely on my corded set for heavy use). The Bravura has good power, stays cool and quiet, has a long lasting battery (2 hours), and won't break the bank. Probably the most disappointing result out of everything we tested. 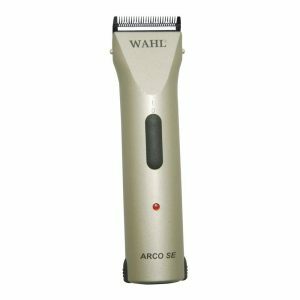 At first the Arco SE appeared to be a solid set, but where things took a turn for the worse was the battery life. It simply could not clip at a consistent rate for more than 30 minutes. Upon closer investigation we discovered it doesn't use a Lithium battery, so the power will continuously drop over time. Furthermore, these batteries take over an hour to fully charge. The set themselves are light, quiet, and as far as I could tell they stay cool for the time being used. The housing feels cheap and hollow, and probably wouldn't survive being dropped too often. Based on the battery life alone, I cannot recommend the Arco SE unless you have a small dog or cat. I would definitely go for Wahl or Andis. They are the only clippers with superior quality. If maintained properly they can last for ages.